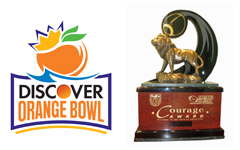 DALLAS (FWAA) – Arkansas' Patience Beard is the weekly nominee for the 2012 Discover Orange Bowl-FWAA Courage Award, to be announced at the end of the season. Beard, a freshman from Douglasville, Texas, made the Razorbacks' cheerleading squad despite a prosthetic left leg. Beard is already becoming known as "the girl with the zebra leg," a reference to the special design of the prosthetic she wears. She was born with a proximal femoral focal deficiency, which affects bone growth. At age 9 months, her left leg was amputated, but it barely slowed her down. She participated in gymnastics as a child, took up cheerleading in middle school and was homecoming queen last year at Texas High School. But even she was surprised to make the 12-member freshman squad at an FBS-level school. "I've always dreamed of this," Beard said, "but never thought I'd be here doing what I've always wanted to do. I can't even put into words how exciting and amazing this year has been already." Arkansas cheerleading/spirit coordinator Jean Nail said Beard is able to perform all of the required stunts and routines. "She's the kind of person we want, "Arkansas cheerleading/spirit coordinator Jean Nail told Yahoo! Sports. "She's a good role model. And she's absolutely qualified." And Nail adds: "Sometimes when you see Patience, it just gives you that little extra edge you need to try one more time." Beard credits her parents with "giving me my drive" and never allowing her to have excuses. "I'd just hope everyone ... would know they can do whatever they put their mind to," she said.